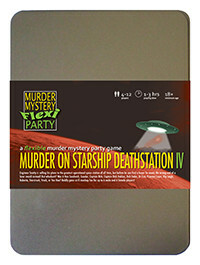 You've been invited to play the role of Starstruck in Murder on Starship Deathstation IV. The infamous Engineer Snotty has just finished the plans for the greatest operational space station of all time, and now he’s invited all sorts of scum and villainy from the across the galaxy to bid for them. But before the auction can begin, Snotty is found in pieces, literally, on the wrong end of a laser-sword! Can you boldly go and find his killer before they strike back again?! STARSTRUCK is a fighter pilot with attitude. Green combat pants, and tight fitting vests (grey with black on top) show Starstruck’s always ready to slide into a cockpit. Unless it’s evening wear in which case anything that’s black and low cut. Starstruck fled from her homeworld, Earth, when a Pylon invasion destroyed most of the landscape. As a young girl she was always a bit of a tomboy, playing with blasters and setting off minor explosions. member of the fleet. Nowadays, Starstruck still serves and defends the Battleship Galapagos, sworn enemies with the Pylons and anything else resembling a cyborg or droid. I’m Starstruck, a fighter pilot currently docked with Battleship Galapagos. I’ll be straight. I was here to steal the plans from Snotty but just didn’t make my move quickly enough. I’d do just about anything to stop the plans falling into the hands of the Pylons. Those cybernetic weirdos would kill everything if they got hold of them. I was in my quarters sleeping off a hangover at about the time Snotty bought it. Happy days. And I’d never use a laser sword, ever. Give me an old fashioned blaster any day of the week.